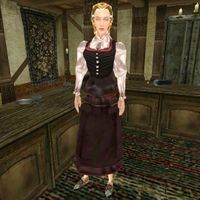 Fryfnhild is a Nord trader who runs The End of the World tavern in Dagon Fel, where she deals in a wide variety of goods. She wears a common shirt with matching skirt and extravagant shoes. She also carries a Nordic broadsword. Aside from her natural resistance to shock, immunity to frost, ability to shield herself, and a natural frost damage spell, she knows no spells. This page was last modified on 28 January 2018, at 20:40.